Chalcedony is a natural mineral, known and admired since antiquity. It occurs in a variety of translucent colors and is most valued when swirls of many different colors are present together in the same piece. In the Roman Empire, it was prized for seals and signet rings; its fine-grained structure allowed intricate carving without fractures. Like many other rare natural materials, it was sometimes supposed to have mystical healing properties. Chemically, chalcedony is identical with quartz or silica, the main ingredient of glass. However, unlike the fabricated substance, the mineral is formed of networks of microscopic interlocking crystals that are responsible for its favorable properties. Small amounts of impurities between the crystal grains cause the swirls of color. 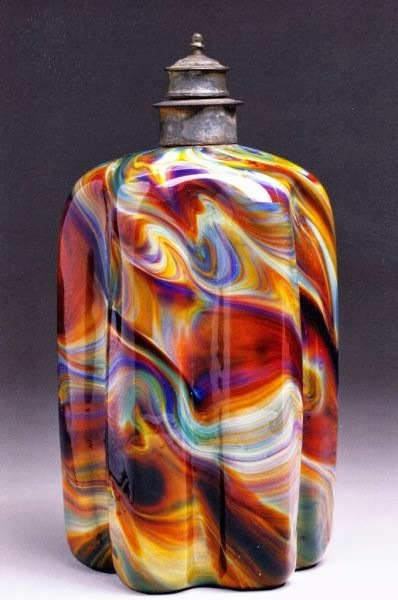 Neri advises that in order to bring out the swirls of color, the glassblower must 'strike' (cool and reheat the piece) several time. Unfortunately, it is not advisable to attempt replication of Neri's chalcedony glass today, as it contained a cocktail of toxic ingredients. While these are relatively harmless once locked inside the glass, in preparation and especially in the hot molten glass melt, vapors of mercury and arsenic can be deadly. At the very least, exposure can be expected to cause permanent neurological and liver damage. (The term "mad as a hatter" comes from the unfortunate side effects of inhaled mercury vapors in the formation of felt hats.) In addition, Neri's extensive uses of strong acid reactions in these preparations make sudden eruptions and severe chemical burns a very real danger.